Congratulations to Fr. Leonard Kostka, C.PP.S., who this year is celebrating the 78th anniversary of his ordination. Fr. Kostka, 104, a native of Chicago who was raised in Detroit, entered the Society in 1931 and was ordained on September 8, 1940. Fr. Kostka has had many ministries in his 75 years as a priest. 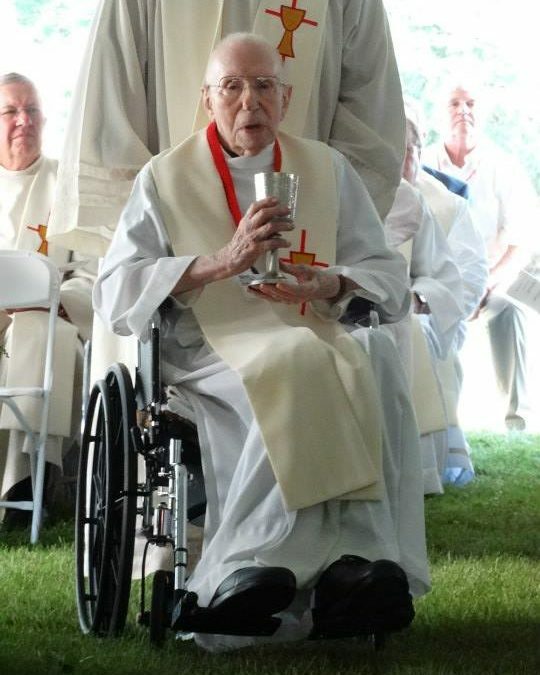 He ministered in parishes in Brooklyn, N.Y., and Detroit; was associate editor of the Precious Blood Messenger; served as a chaplain at Seton Hill College in Greenburg, Pa.; and was a navy chaplain from 1945-47. In 1948, he was appointed a professor of Saint Joseph’s College in Rensselaer, Ind., which is sponsored by the Missionaries. There he served as part of the college family for over 60 years, as a chaplain and instructor of religion courses. He also helped at St. Augustine Parish in Rensselaer for many years. Fr. Kostka served as a professor emeritus at the college, where he could be seen around campus supporting the students, faculty and staff. In 2013 he retired to St. Charles Center in Carthagena. He is the oldest living member of the Cincinnati Province. Fr. Kostka’s anniversary, along with the milestone anniversaries of 12 other Missionaries of the Precious Blood of the Cincinnati Province, signifying hundreds of years of ministerial service to God’s people, will be celebrated in a special liturgy on July 2 at St. Charles Center. The Missionaries of the Precious Blood is a religious society of priests, brothers and lay associates founded in 1815 by St. Gaspar del Bufalo. Society members work as missionaries in parishes in the U.S. and abroad, in education and in a wide range of apostolates, promoting the cause of God’s reconciliation worldwide by proclaiming the Word.